Whether you’re celebrating Cinco De Mayo or just Taco Tuesday…these BBQ salmon tacos will hit the spot! Preheat oven to 400 degrees. Add salmon to a foil lined baking sheet. Bake for 50 minutes. Remove from oven and slather BBQ sauce on salmon liberally. Return to oven for 10 minutes. BBQ sauce should be warm and bubbling. Remove from oven and use large spatula to separate fish from skin. 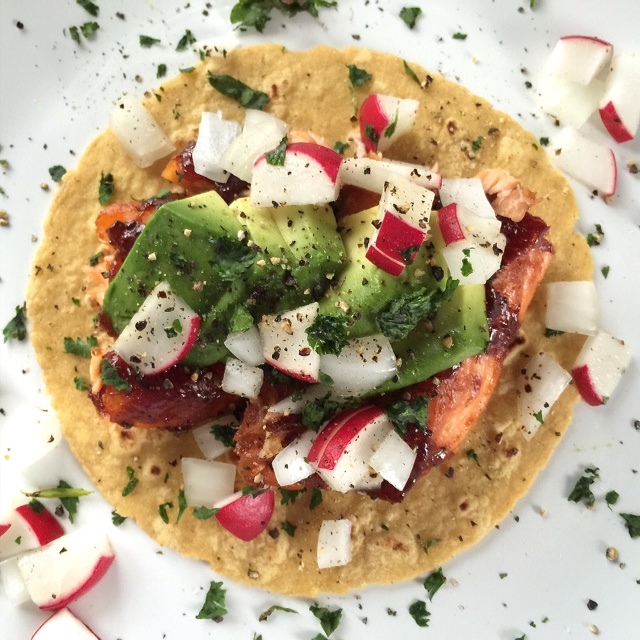 Assemble your taco: top tortilla with salmon, avocado slices, onion, and radish. Sprinkle with cilantro and salt & pepper. Add a squeeze of lime. Serve immediately.